Last week, militants staged a series of attacks in Myanmar’s troubled Rakhine region. Armed with machetes, sticks, improvised explosive devices and a few small firearms about 150 men raided 30 police posts and one army base in the early hours of 25 August. They killed 10 policemen, one army soldier and one state official. At least 80 insurgents lost their lives. Myanmar’s security forces have since conducted an extensive counteroffensive against what its commander-in-chief describes to be “extremist Bengali terrorists”, in reference to the government’s preferred label for those who are otherwise known as the Rohingya minority. Tens of thousands Rohingya civilians have since been fleeing the violence. Aung San Suu Kyi hold the insurgents responsible for what is happening. Allying firmly with the military, her office officially designated the militants – who call themselves Arakan Rohingya Salvation Army (ARSA) – as “terrorists”. Issuing a warning to the media against writing in support of the group, it ordered journalists to use the word “terrorists” instead of “insurgents”. From an academic perspective, “terrorism” is a fuzzy and often overstretched concept. This notwithstanding, students of political violence have long attempted to distinguish between “terrorist” and “insurgent” violence. One frequently mentioned distinction seems particularly important in the context of Rakhine. 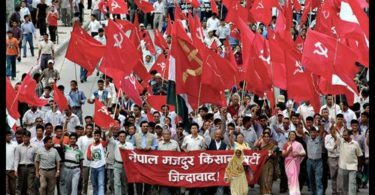 While insurgents and terrorists are both fighting for political aims with violent means, their main means and targets of violence are different. Insurgents seek to effectuate political change by targeting the state and its agents. They commonly do so by means of guerilla warfare. Terrorists, in contrast, intentionally target civilians in order to achieve political goals and strategies. The direct targets of terrorism (civilians) serve as “message generators” in the process of “violence-based communication” with the main target of terrorism (e.g., the state or society). Insurgents then can also be terrorists, if using systematic violence against civilians, but do not necessarily have to be. Considering this, the attacks of Rohingya militants on police and army units look more like insurgent violence than terrorist violence. To be sure, the Myanmar government has accused the ARSA to target civilians. For anyone familiar with the conflict in Rakhine it also comes to no surprise that social media is full with graphic images of mutilated civilians. As the Myanmar government has banned any independent reporting in the affected regions of northern Rakhine State none of this verifiable. It is beyond doubt that violence against civilians has been committed by all sides in the protracted communal conflict between the Rakhine and Rohingya people. From what we know, however, ARSA militants have hitherto focused their attacks on the state’s security personnel. This stands in contrast to Myanmar’s security forces themselves. Again, independent monitoring is banned but all available evidence suggests that military units are indiscriminately targeting Rohingya civilians. Their ongoing operations against ARSA has sent tens of thousands Rohingya fleeing. Current numbers estimate that ongoing violence has displaced between 38,000 and 70,000 people. 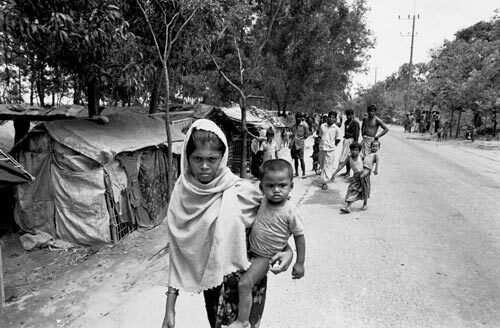 Those arriving in neighboring Bangladesh speak of horrific violence and ethnic cleansing at the hands of both the military and the vigilante counteroffensive. Satellite images reveal that villages are being burned down systematically. That the military has a long track record of indiscriminately targeting civilians in their offensives in all parts of the country is well-documented. After the forerunner of the ARSA staged its first attacks on border posts in October of last year, state forces have reportedly committed mass killings and gang rapes of Rohingya civilians in six month-long “clearing operations” that similarly sent 87,000 people fleeing to neighboring Bangladesh. According to the UN Office of the High Commissioner for Human Rights, these actions “very likely” amount to crimes against humanity and possibly ethnic cleansing. It thus seems that the state is responsible for most of the terror against civilians in Rakhine State. Against this background, it might seem puzzling that Nobel Peace Prize laureate Aung San Suu Kyi is so ardent at denouncing Rohingya militants as “terrorists”. For students of political violence it is not. To proscribe an armed group as “terrorists” is foremost a political act that serves powerful discursive functions, including the de-legitimization of the enemy and legitimization of extraordinary policy measures. Scholars have debated this at length with regards to the Western “war on terror”. In Myanmar, calling ARSA terrorists instead of insurgents serves similar functions. In fact, stressing the “terrorist” nature of Rohingya militants seems to be a clear attempt to embed the Rakhine conflict within a global “war on terror” narrative. Similar to Russia’s “war on terror” in Chechnya, this is meant to legitimize heavy-handed counterinsurgency practices, not least for the international community. Unsurprisingly, military spokesmen have been quick to emphasize the difficulty in distinguishing civilians from combatants in their fight against Rakhine “terrorism”. Most importantly, the case of the ARSA illustrates how authorities can create hierarchies of legitimate resistance by distinguishing between somewhat legitimate “insurgents” and completely illegitimate “terrorists”. This is particularly interesting in the context of a country that is home to a dazzling array of ethnonational insurgency movements. In this respect, it is noteworthy that many members of Myanmar’s established ethnic armed groups, such as the Kachin Independence Organisation (KIO), do not want to be called “insurgents” either. They prefer the term “armed ethnic organizations” for their movements instead. Myanmar’s government uses a variety of expressions to refer to armed opposition groups. For movements that signed ceasefire agreements it often uses “ethnic armed organisations”. The ones that continue with armed struggle are often condemned as “insurgents”. In denying the Rohingya uprising the second-best label of “insurgents” and calling them “terrorists” instead, Aung San Suu Kyi placed them firmly at the bottom of legitimate resistance in Myanmar. David Brenner is Lecturer in International Relations at the University of Surrey. He holds a PhD from the London School of Economics (LSE), where he remains affiliated as an Associate Fellow at the Global South Unit. The government of Myanmar has the primary responsibility to ensure that humanitarian assistance is provided to all who have been displaced by the recent terror attacks in Rakhine State. Effective measures are being put in place by the Government to provide humanitarian assistance to all those affected by the terrorist attacks. To implement this, the Government will work together with the Red Cross Movement. A Coordination Meeting was held today at the Ministry of the Office of the State Counsellor. The Meeting was attended by Union Minister for the Office of the State Counsellor U Kyaw Tint Swe, Union Minister for Social Welfare, Relief and Resettlement Dr. Win Myat Aye, National Security Advisor to the Union Government U Thaung Tun, Deputy Minister U Khin Maung Tin, the Secretary of the Rakhine State government and responsible personnel. Also present at the Meeting were development partner countries represented by Ambassadors of United Kingdom, United States, Denmark and the Charge d’Affairesa.i. of the Australian Embassy, the Charge d’Affairesa.i. of the Delegation of the European Union and the UN Resident Representative, as well as representatives from the Myanmar Red Cross Society (MRCS), the International Committee of the Red Cross (ICRC), the International Federation of Red Cross and Red Crescent Society (IFRC). The Government’s plan to provide humanitarian assistance was intimated at the Meeting. The Meeting discussed how the international community could most effectively support the Government’s efforts to provide humanitarian assistance to all inhabitants of Rakhine State who have been displaced since 25 August 2017 by terrorist attacks. Legitimate resistance against what? A legitimate democratic government? I do not totally buy the narrative that the Rohingya are the innocent party here. This more clearly fits the pattern of Muslim terrorism provoking a legitimate reaction and then the Muslim leaders order their followers to throw themselves into supposed “refugee” status as the Arabs did in 1948 causing pseudo refugees to be generated and ultlimatey considered legitimate refugees by a gullible world. When a country or region does not react promptly to a Muslim takeover, it ends up like Kashmir, with the original majority Pandits killed or driven out and replaced by a new Muslim majority. I am not saying that there is no possibility that the Myanmar Buddhists over-reacted in this case. But I tend to believe Aung San Suu Kyi more than the usual crowd of Muslim apologists. But I would like to see the violence stop in any case.